We only stock the more common reticles and stage micrometers. Our extensive range of counting cells and haemacytometers is on page S6. Non stock item on this page are available within three weeks, except certified products which take longer. 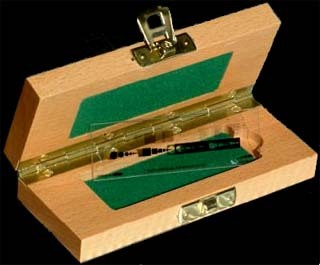 Stage micrometers are normally mounted on standard size slides. When the reticle image is on the glass surface, this micrometer can be brought into direct contact with the specimen mounted thereon for measurement. It is rarely practical or economical, however, to mount specimen and scale together. For this reason, most measurements in microscopy are made by means of an eyepiece reticle, and the function of the calibration scale is to calibrate the system. The stage micrometer is protected by a coverglass which also duplicates the specimen's optical conditions. The 1mm stage micrometer is also available without coverglass, for use with reflected light, as is commonly used in the material sciences. The following Stage Micrometers are supplied with the manufacturer's certificate of conformity. Also available, but at additional cost are Comparison (standards) Certificate by either the manufacturer or a choice of two independent Standards Laboratories. The glass discs are mounted in stainless steel slides with engraved serial numbers. Each slide is supplied in a polished wooden presentation and storage box to distinguish it as a traceable standard of high value. Best means for the calibrations of compound microscopes at low magnifications, stereo microscopes and measurement of fields of view that require a longer scale than those traditionally available. This new PS5 has a high accuracy scale of 20mm length, which is subdivided into 10 micrometer divisions. The scale is produced as a vacuum deposited chrome image on a square of glass, with a coverglass cemented on top. 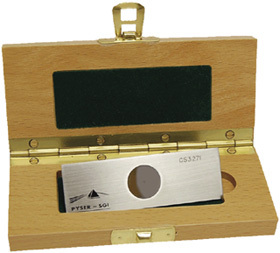 This is mounted in a stainless steel slide mount and is supplied in a polished wooden case. Internationally traceable certificates of calibration are available to satisfy the requirements of ISO. The National Physical Laboratory carries out measurements at selected points on the scales and grids and issues a certificate of calibration. A UKAS accredited laboratory carries out measurements at selected points on the scales and grids and issues a calibration certificate. For applications which do not require the accuracy provided by calibrations carried out by NPL or a UKAS accredited laboratory, reticles can provide a Certificate of Comparison. The scale or grid is compared with NPL calibrated in-house standards and a statement is provided on the accuracy of the item with respect to these standards. The dual circle with the scale centered in the inner circle is made from evaporated chromium. It is uncovered and therefore useable for reflected and transmitted light. If used to calibrate an oil immersion objective, it is preferable to mount a small circular cover slip on the stage micrometer slide. We have tested the scale and it seems to be accurate to better than one percent; we cannot get it certified. Clearly, accuracy is better than required for most biological applications and because of its low price, this calibration slide is suitable for school or university class exercises calibrating compound microscopes. The scale divisions are 0.01mm and the total scale is 1mm long. are available for an additional AUD55.00. Note: Stage micrometers can be purchased certified, but not reticles. The area or length they 'see' would differ with the microscope and its configuration. So the readings are comparative unless used in conjunction with or calibrated using a stage micrometer. The comparative values can be entirely accurate. 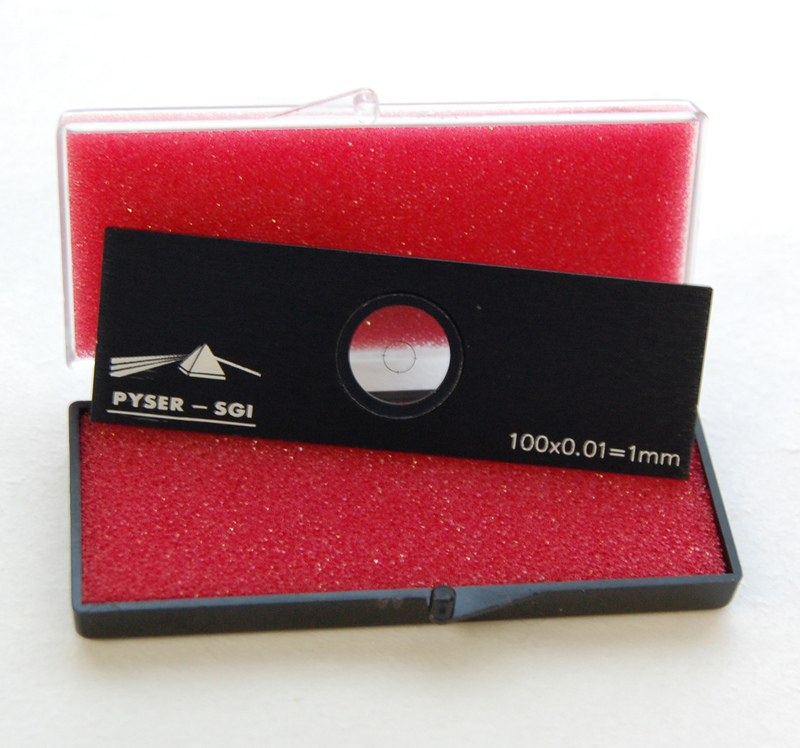 We offer a selected range of micrometer scales for the most popular applications in light microscopy. 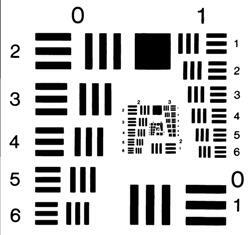 The reticles have surface patterns; sandwiched types are available at considerably greater cost. Length: 10mm, 100 divisions, 0.1mm per division. The scale is 10mm long with numbered millimetres and scale graduated in tenth of millimeter. The only size available is Ø 21mm, unless the minimum order is for 50 pieces or more. In education applications in particular there are requirements for economically priced plastic reticules for use with magnifiers as a simple measuring tool, in the eyepiece or on the microscope stage. Each strip has 5 reticules images (10mm scale in 0.1mm divisions) with cut guides for 16mm, 19mm, 21mm and 24mm diameters, supplied in packs of 2 strips, 10 reticules. Spacing allows up to 27mm diameters to be cut. 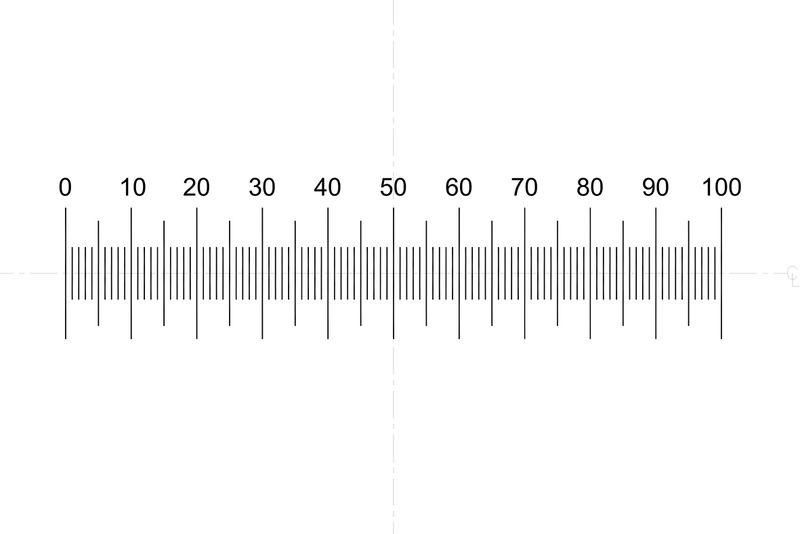 10mm length horizontal scale subdivided into 100 divisions of 0.1mm (100µ), with centered crossline. This eyepiece reticle has an overall length of 10.00mm with 100 subdivisions of 0.1mm. When used with a x10 objective each division will represent 10 microns on the specimen. By dividing the division of the chosen reticle by the magnification of the objective one obtains an approximate value that each division will represent on the stage. 100 x 1mm squares in a 10 x 10 grid, indexed 1 - 10 along top and A - J down the side. 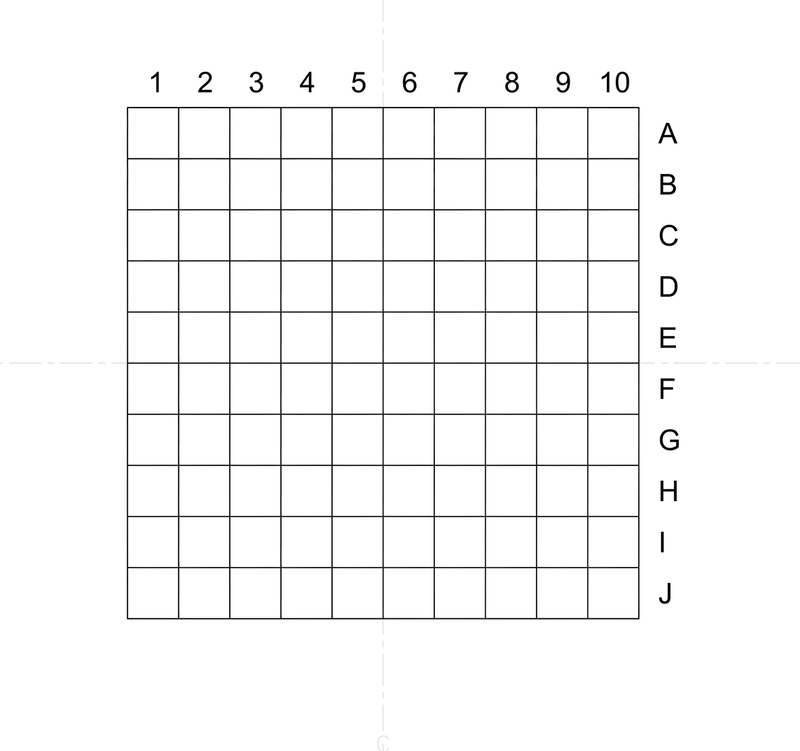 Standard version has 100 squares arranged in a 10 x 10 grid or total area 7mm x 7mm. Central square is further subdivided into 5 x 5 grid. 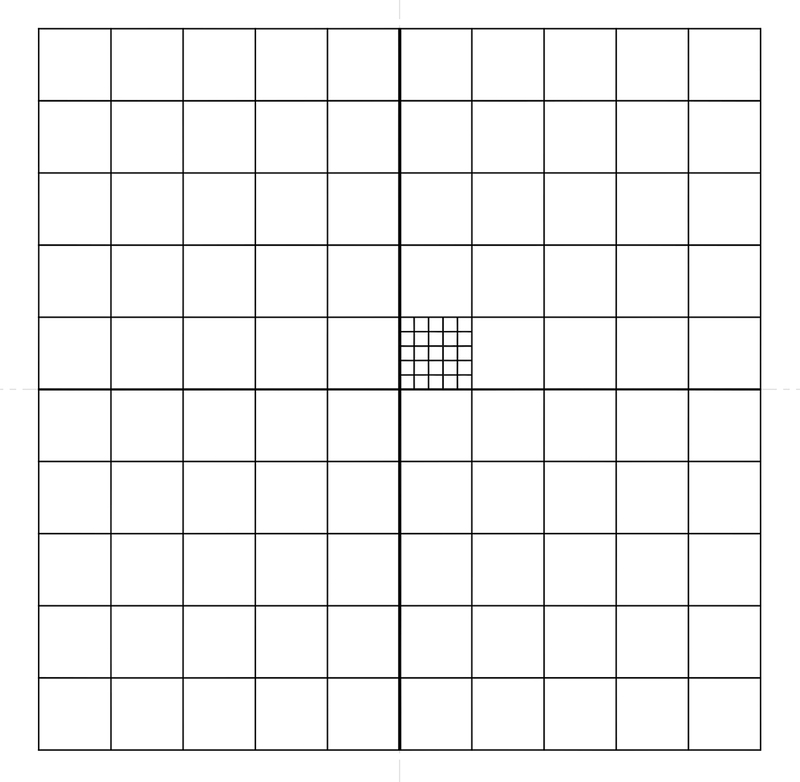 Ratio of full square to smallest square is 50:1, area ratio is 2500:1. 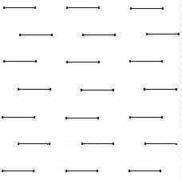 Centre cross‐line is thicker than the other grid lines. 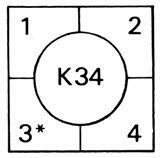 This reticle is also available with a 10mm x 10mm grid to special order. 16mm, 19mm, 21mm, and 23mm. Diameters other that those above can be custom built at an additional cost. 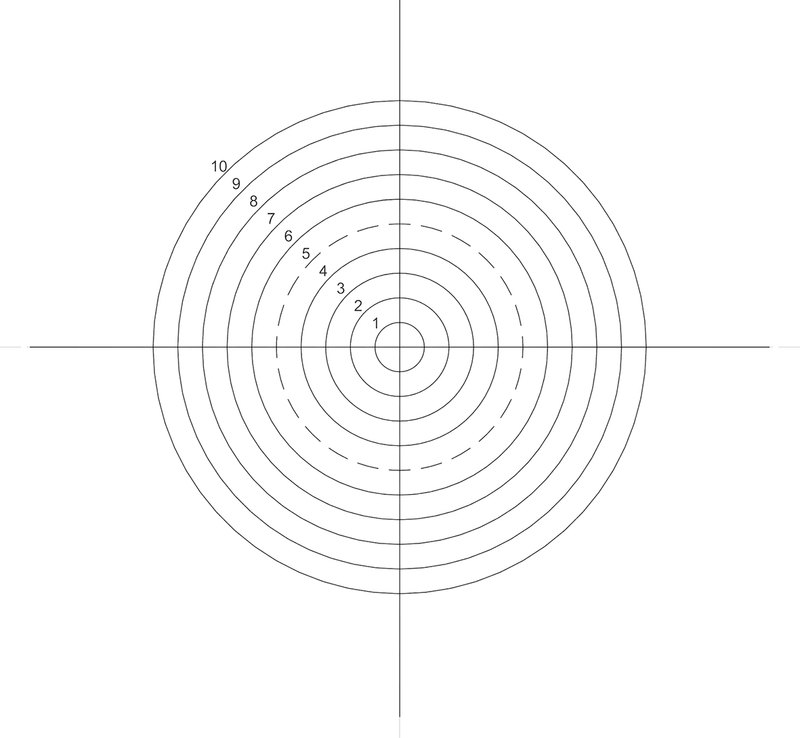 Concentric circles, 0.25mm diameter to 2.5mm diameter in 0.25mm steps, total 10 circles each numbered, 5th circle has dashed lines. 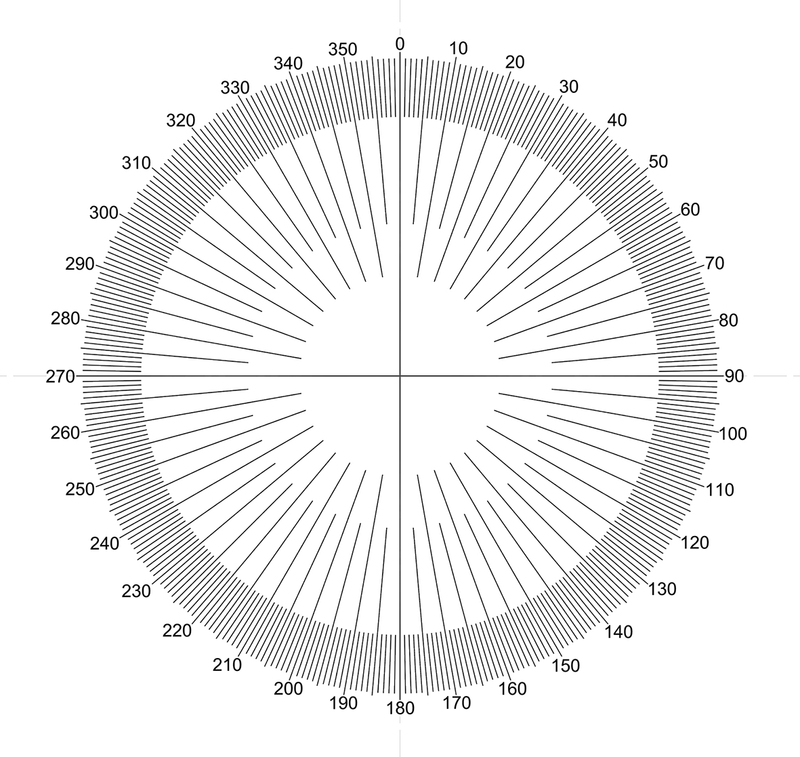 Reticle has 360° protractor, 10mm diameter, centrally located, with 1° divisions. 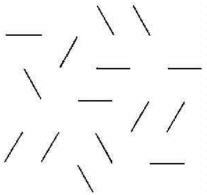 Composed of 15 equal lines which connect the vertices of a regular hexagonal point network. Weibel claims this pattern "ensures the end points are evenly distributed and avoids any bias." Ref.E.R Weibel, Lab. Invest., Vol. 22, pp131-155. Principle and methods for the morphometric study of the lungs and other organs. Used for the quantification of surface to volume ratio of structures per mass unit. This reticle has a number of short lines with equal short breaks. The number of intersections falling over the short lines are counted and the number of end points falling on the end of a structure is determined. Ref. E.R. Weibel, Journal of Microscopy, Vol.95, pp373-378. 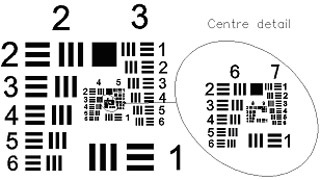 Current capabilities and limitations of available stereological techniques: point counting method. This reticle is used for counting fibrous dust, (e.g. asbestos or glass fibres) and is most useful where the majority of the fibres are smaller than 5 microns. The circle is divided into four by two diametrical lines scaled in units of 5 and 3 µm respectively. Unlike the usual globes of other partial reticles, Walton and Beckett's has a series of shapes for comparison. 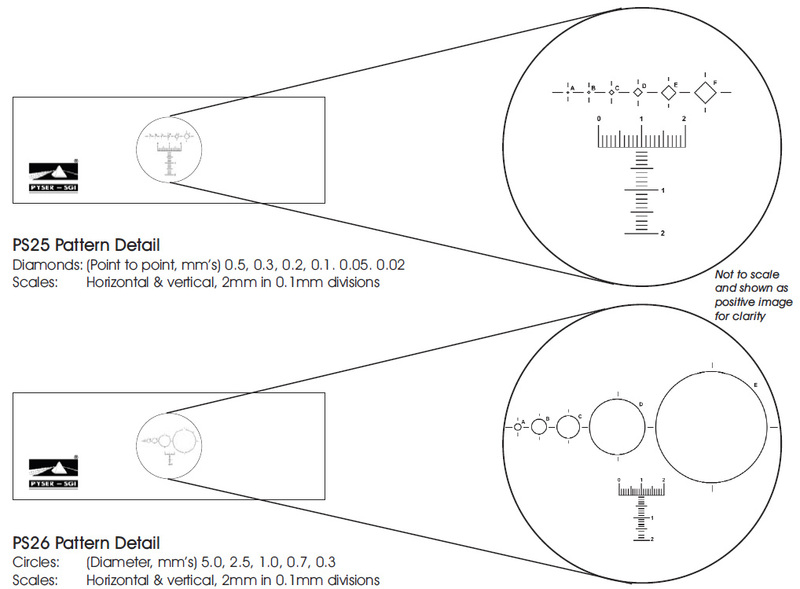 These shapes have been designed for comparison with fibres, especially since they incorporate an aspect ratio of 3:1 essential for such analysis. 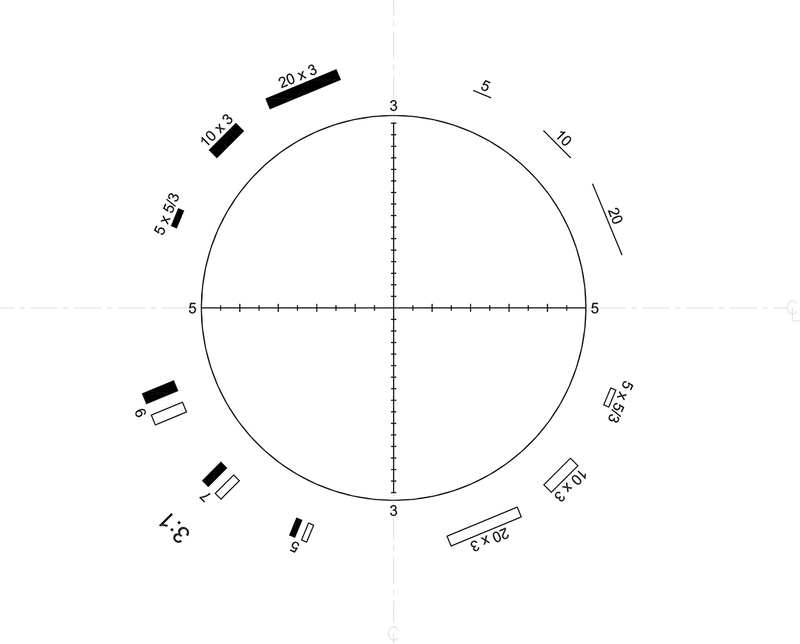 Important: for accurate work the counting field circle on this reticle must represent 100µm at the microscope stage. It is essential that the G22 suits a particular instrument and its configuration. When ordering a G22 reticle be sure to give details of your microscope, eyepiece, objective magnifications, and an exact calibration factor. A microscope eyepiece reticle for the evaluation of fibrous dusts. 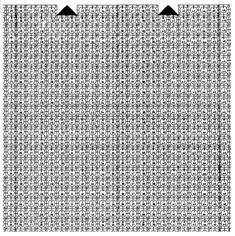 The England Finder is a glass microscope slide with a uniquely indexed grid pattern that allows individual areas of interest to be referenced. All England Finders produced by Pyser-SGI over the last 40 years are identical. The purpose of the slide is to give microscopists an easy method of recording the position of a particular area of interest, so that the same position can be re-located at a later date, or by another person in another laboratory, or when using an England Finder in another microscope. The location of the positioning arrows is identical for all England Finder slides. The method of use is as follows: Mark a label on the left hand side of the specimen slide, indicating the orientation to be repeated. Locate any area of interest on the slide then, without moving the stage, replace the specimen slide with the England Finder, the feature of interest can then be identified and noted from the index pattern. The area of interest can then be relocated at any time using the reverse of this procedure. The phase contrast test slide was developed by the Health and Safety Laboratory (HSL), on behalf of the Health and Safety Executive (HSE) and the National Physical Laboratory (NPL). It is made in the UK under licence from the National Physical Laboratory (NPL). Each of the HSE standard test slides is an epoxy replica of the NPL master, certified by HSL. The replica is mounted on a microscope slide and covered with a glass slip 0.17mm thick. 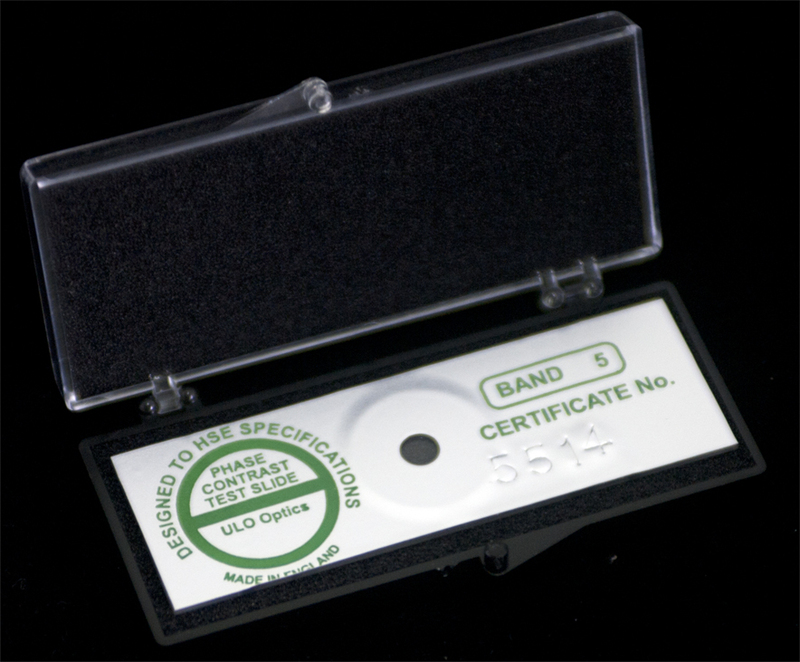 The test slide includes a calibration certificate by the British Health and Safety Laboratory, certifying that when viewed "by phase contrast optical microscopy, band 5 is fully visible and band 6 partially visible at 500x magnification." Full details are supplied with the slide, more information can be found in the Specification & user notes link below. Note: Different test slides are in common use, or mandated by certifying authorities. NIOSH (USA) red slide 4 bands. HSE (UK and Australia) green slide 5 bands. General non-asbestos microscope calibration yellow slide 6 bands. USA may use band 5 and 4 if the calibrating person understands the process, similarly band 6 could also be used. 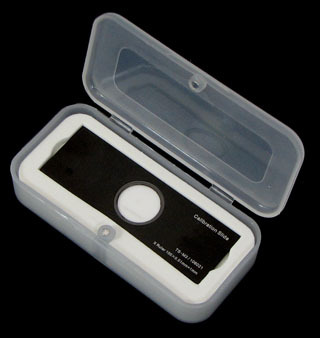 Walton & Beckett eyepiece reticles and PS12 calibration scales with UKAS certificates are frequently required by users of this slide - we stock both. Designed for measurement calibration of microscopes and machine vision systems. Includes Concentric Circles and Squares, Line Gratings, Grid & Dot Arrays, Geometric root2 progression of Dots and Square blocks as well as course and variable fine linear Line Scales. 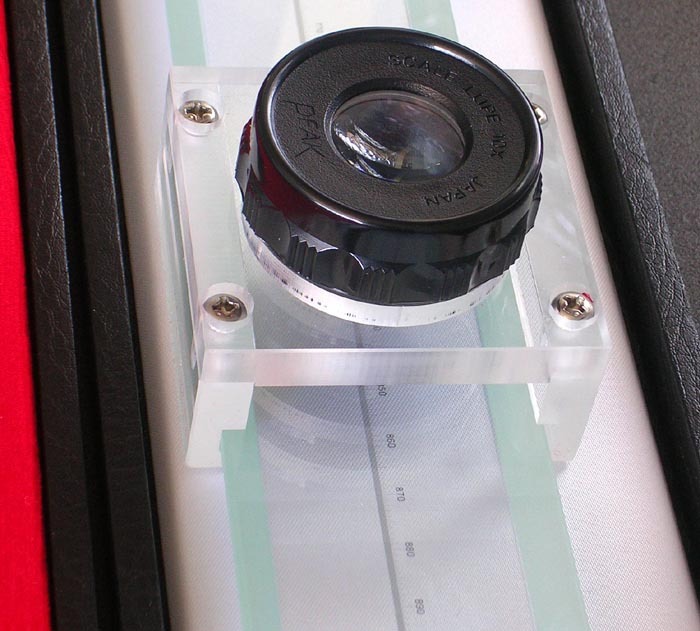 Each glass slide has a unique permanent serial number and can be supplied with full or partial UKAS certificate of accuracy. Starting from a fixed ‘Datum point’ mark, each individual pattern or array can be located using X, Y coordinates. See User Note. Calibration of microscopes and image analysis systems is becoming more sophisticated, with the requirement being for a variety of image patterns to satisfy the numerous parameters. 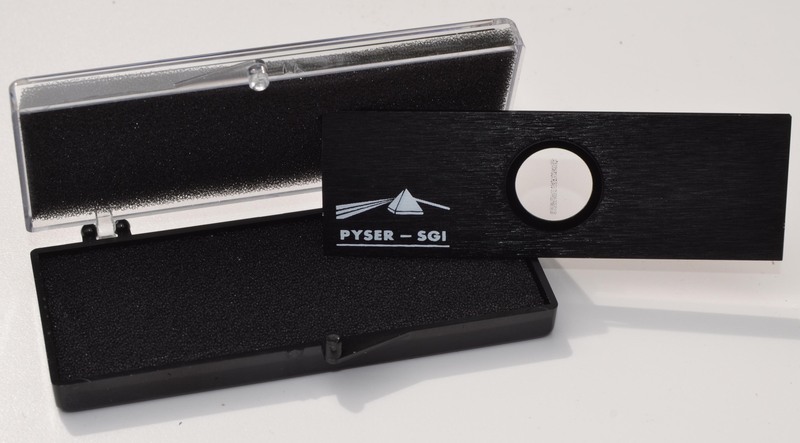 Pyser-SGI has introduced a new multi-function calibration standard specifically for these applications. Multiple images on a single slide provide the most cost-effective solution to calibration and resolution checking of microscopes and image analysis systems. The combination of scales, dots, circles, squares, rulings, grids and angles can be supplied with an internationally traceable certificate of calibration for those who require ISO conformity. 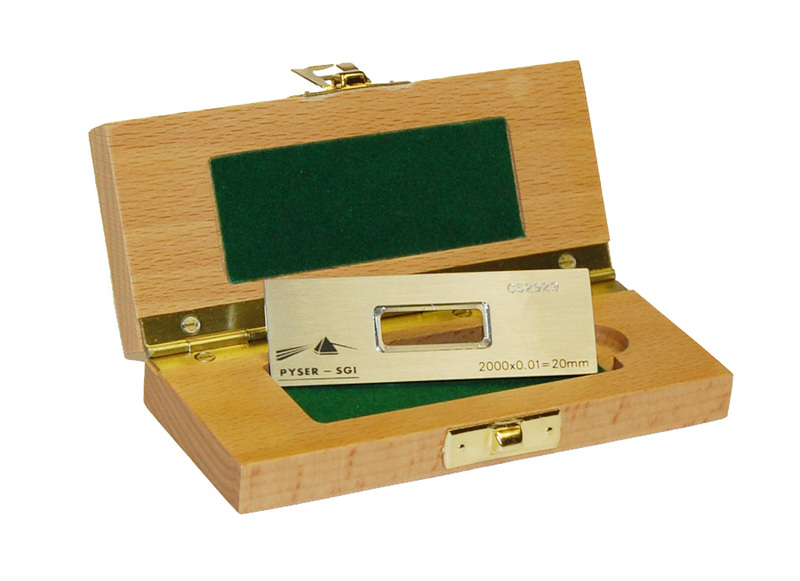 This precision grating glass slide with 200 line‐pairs/mm can be used with microscope or camera systems to check for resolution and distortion, and is supplied in a polished wood case for extra protection. Metallic grating pattern with opaque lines. The glass is B270 with refractive index of 1.52. The original 1951 USAF Resolution Test Chart is a resolution test pattern which conforms to MIL-STD-150A standard, set by US Air Force in 1951. USAF resolution charts are recognised the world over as a universal standard for testing the vertical and horizontal resolution of imaging systems. Each element on the chart comprises three vertical bars and three horizontal bars; the resolution of the imaging system is normally specified as the finest Group and Element which can be clearly defined. These four new versions with detail down to Group 9, Element 3, as fine as 0.78microns (644 line-pairs per mm, meet the need for higher resolution. Users can select positive or negative versions on either a square glass plate or steel microscope slide, to suit their application. The slide version of the USAF resolution chart comes on a 76 x 25mm stainless steel mount to reduce the risk of breakage. A unique serial number is engraved in the surface of the mount to give traceability. The square plate version is imaged on a glass plate measuring 50 x 50mm. This larger plate also has groups 0 and 1. Two patterns are available, 0 - 7 and -2 - 7, produced in accordance with the USAF Resolving Power Test Target 1951 Standard. 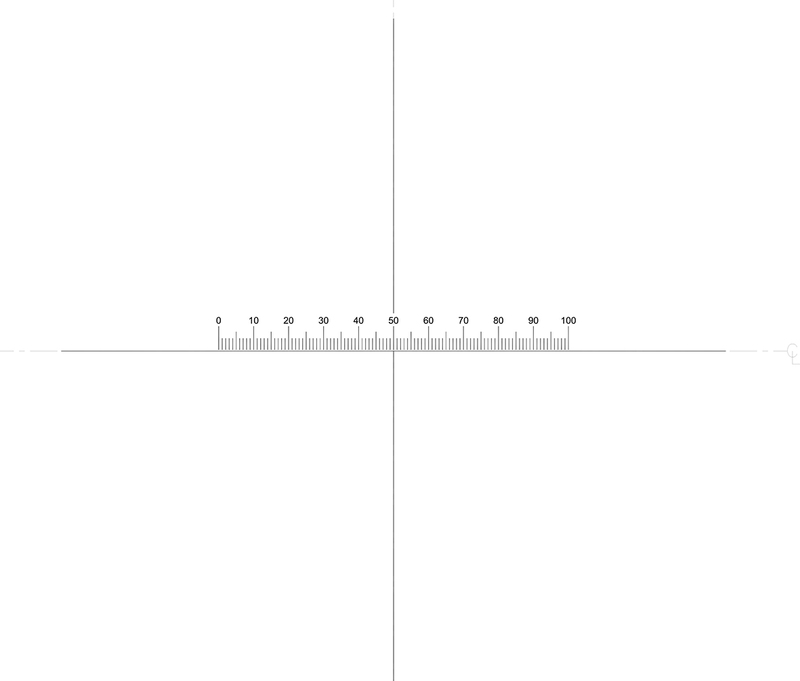 The most popular range is 0-7 group, with 6 elements per group, an element consisting of two target patterns of 3 lines at 90 degrees to each other, the line space ratio being equal. These charts are produced as a chrome surface image on glass plate. The R70 has an image area of 12 x 12mm on a 51mm square plate and the R71 has an image area of 48 x 48mm on a 75mm square plate. Both plates are 1.5mm thick. Calibration slides with dual imperial/metric scales.The PS52P is for transmitted light applications and has a bright chrome positive image. The PS52N has a negative pattern, formed in low reflective chrome for incident light applications to give excellent contrast. Both are ideal for calibrating optical products with a large field of view, such as stereo microscopes or imaging systems. PS25 is designed for Vickers and Rockwell methods and has a series of diamond shapes of varying size and x-y scales. Each of the markings on the slide is clearly identified with its size. The PS25 has a glass disc with the image precision marked in vacuum deposited chrome This is cemented into a stainless steel slide mount, making the item very durable. The slide has a unique serial number indelibly marked on the slide mount and can be supplied with an internationally traceable certificate of calibration. PS26 is designed for the Brinell method and has a series of circles, to represent the ball indentation shape, of varying size and x-y scales. 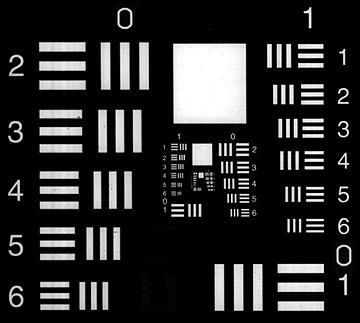 The PS26 has a precision marked chrome deposition image on a glass slide. Each of the markings on the slide is clearly identified with its size. The slide can be supplied with an internationally traceable certificate of calibration. 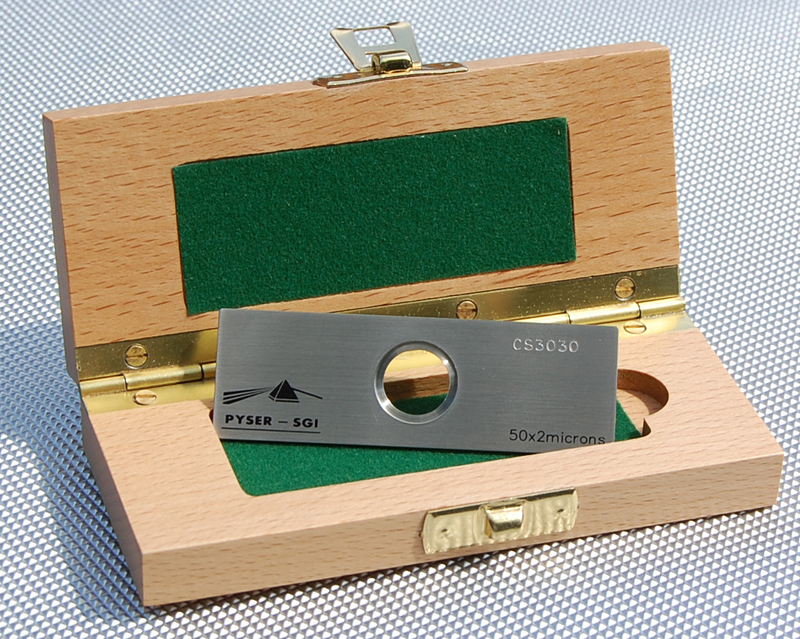 Both products are supplied in a polished wooden box. Calibration is performed by a UKAS accredited laboratory, whose measurements are traceable back to the UK's National Metrology Institute, the National Physical Laboratory. All of the NMIs in the world work in harmony under the international diplomatic treaty, the Treaty of the Metre, signed in 1875. This means that all measurements carried out by the UKAS accredited laboratory are internationally traceable and satisfy the requirements of NIST, DIN and all other NMIs across the world. Calibration slide, PS26, for hardness testers, Brinell, with UKAS cert.